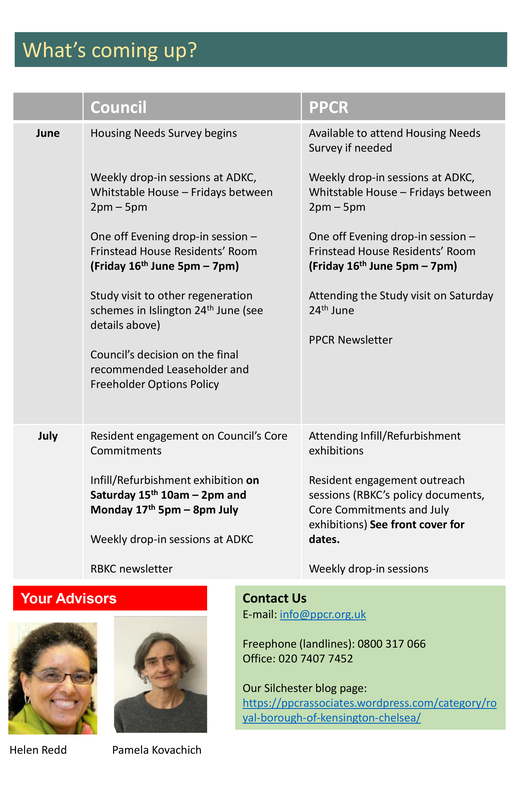 RBKC were due to hold consultation events on the Options Appraisal for Silchester East and West in July and September, with a Cabinet decision expected in November 2017. 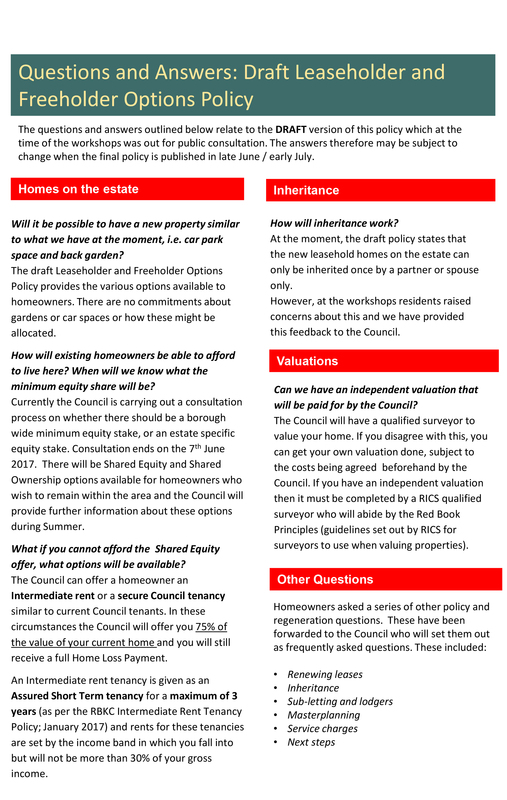 A Draft Leaseholder and Freeholder Options Policy was also due to be considered by Cabinet on 29 June, following a borough-wide consultation. Given the catastrophic tragedy at Grenfell Tower, all work on the Options Appraisal and on the Leaseholder and Freeholder Policy has been put on hold. 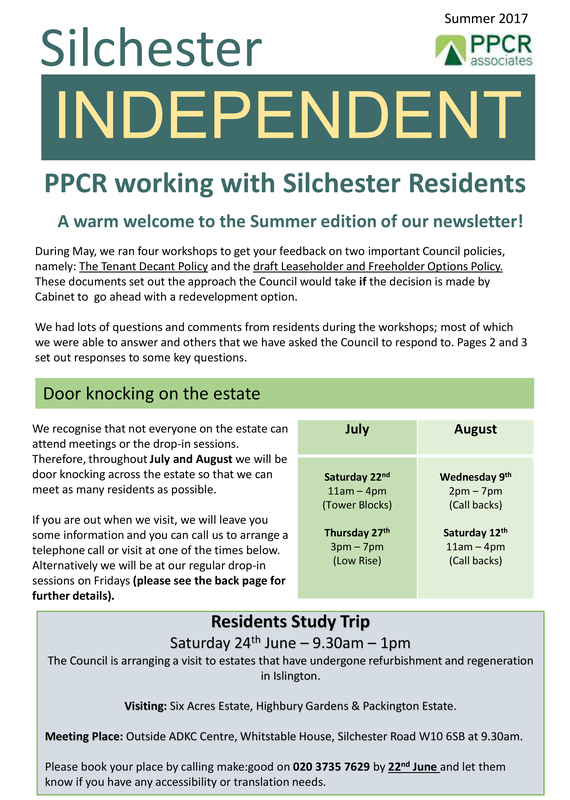 The study trip, weekly drop-ins, housing needs surveys, forthcoming residents’ meetings related to the Options Appraisal and the July and September consultation events will all be postponed. for further update. 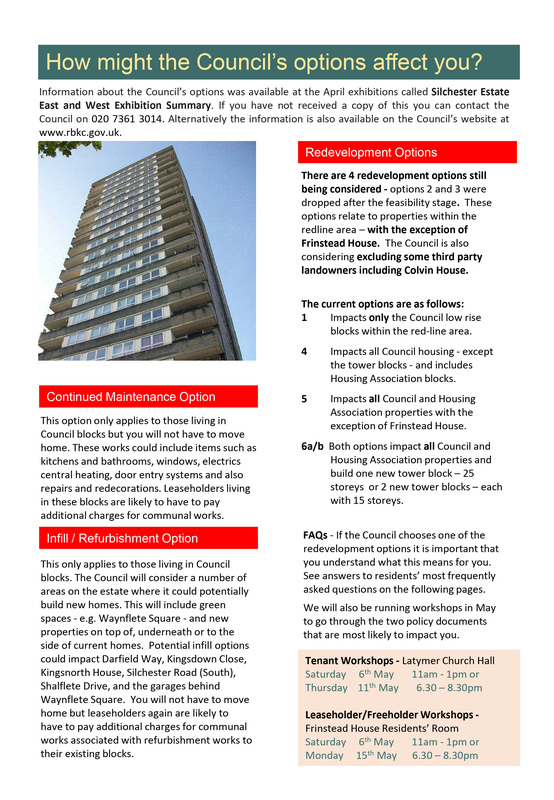 RBKC will update these pages and write to Silchester residents again when they have further information. This entry was posted in Archive, Silchester East & West Estate. This entry was posted in Archive, Newsletters, Royal Borough of Kensington & Chelsea, Silchester East & West Estate. This entry was posted in Archive, Royal Borough of Kensington & Chelsea, Silchester East & West Estate. PPCR are running workshops for tenants and homeowners. 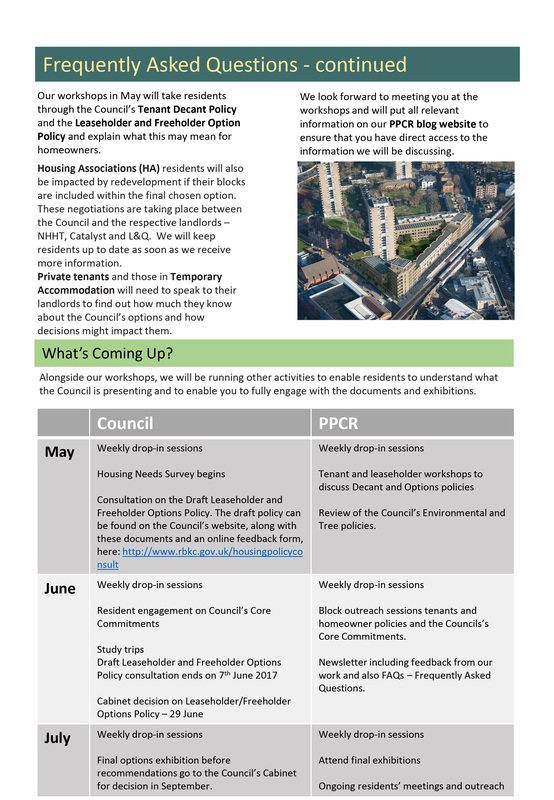 The workshops are your opportunity to talk to your Tenants and Leaseholders/Freeholders advisor for a clear explanation of what is the Draft Options Policy and for you to ask any questions about your concerns. PPCR will explain what the (draft) Options might mean for you. 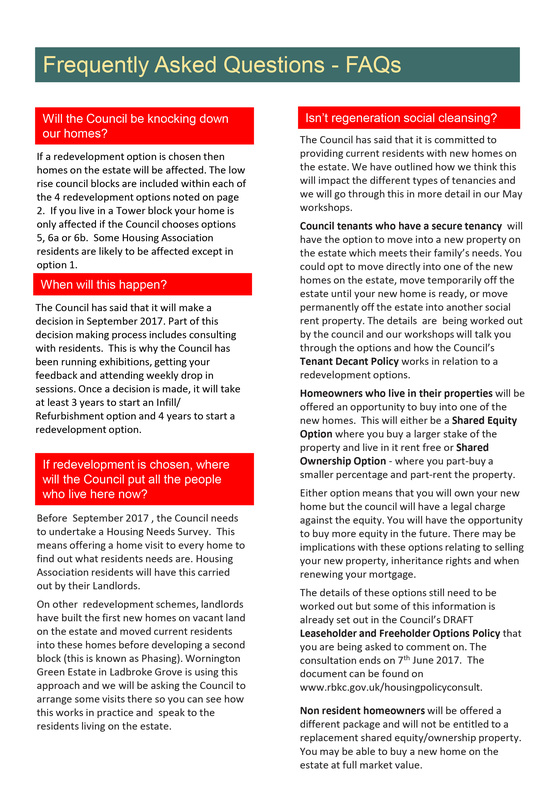 To assist with the consultation process and if you are a Leaseholder or Freeholder the Council invites you to comment on any aspects of the draft completing the feedback form on their website by the 7th June, 5pm. The Council will agree a Final Version of the policy at the end of June. 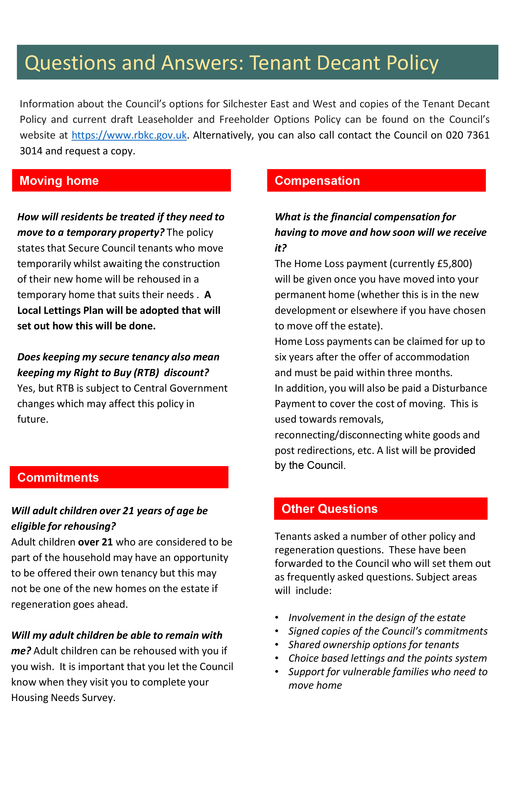 RBKC is in the process of publishing a summary booklet of the Tenant Decant Policy which will be available at the workshops. 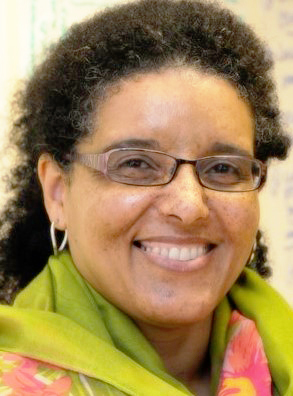 If you have a question for Helen Redd please complete the form below and Helen will answer your queries. Alternatively, you can contact her 0n Freephone 0800 317 066 for landlines or on 020 7407 7452 for mobiles. Are you interested in joining the Regeneration Panel for Silchester East and West? On Saturday 28th and Monday 30th January, Helen and Pamela, attended the Council’s drop in sessions at Latymer Church where they met a lot of residents who were interested in joining a new resident engagement panel that PPCR are setting up. The panel will bring together representatives from tenants and leaseholders who live on the estate to question and scrutinise the Council’s proposals for changes to your homes. 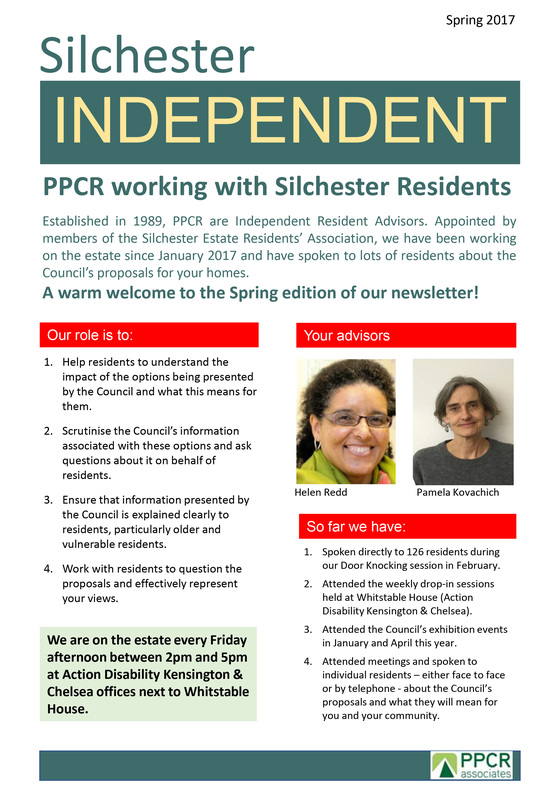 PPCR would also like to include housing associations residents who also live on the estate. We have already received interest from a few residents and would like to have around 25 people to make up the panel. If you are interested and want to find out more, please contact PPCR on 0800 317 066 or by email at info@ppcr.org.uk or use the form below to communicate with Helen Redd or Pamela Kovachich.